According to World Atlas, 2017, Malawi is one of the major exporters of groundnuts in Africa. Malawi has a history of supplying groundnuts to the global market and its yields compete with regional competitors. Groundnut is the most important legume crop produced in Malawi – both in terms of production area and volume – and is produced predominantly by smallholder farmers. It also holds significant economic importance, with approximately 40 percent of total production marketed. However, until the 1990s, groundnuts were only considered an export crop; now, a burgeoning domestic groundnut market has helped to grow the total number of producers. In January 2018, we conducted a reconnaissance study as part of the APRA work in Malawi to determine the trends in groundnut commercialisation, with a focus on two major groundnut producing districts: Mchinji and Ntchisi. The study was mainly qualitative, involving focus group discussions with community members, those that are members of farmer organisations and non-members; we also conducted key informant interviews with extension workers at Extension Planning Area (EPA) level, local community leaders, and trade officials and agribusiness officers at district level. We also held an in-depth interview with the CEO of National Smallholder Farmers Association of Malawi (NASFAM), a largest smallholder owned membership organisation in Malawi which is funded by the US government and was originally formed to support and organise smallholder tobacco production but now the focus has diversified to other cash and food crops one of which is groundnuts. The interview was held in order to get an insight into the commercialisation of groundnut production from their perspective. 1980s: During this time, groundnuts were being produced, but on a small scale and primarily involving women; while men concentrated on tobacco production. Groundnuts were sold to the Agricultural Development and Marketing Corporation (ADMARC). Reasons for groundnut scarcity include: greater incentives in tobacco; the presence of communal labour, which was mainly dedicated to tobacco; prices in the 1980s were lower for groundnuts; there were no improved varieties. 1990s: Groundnut production dropped further due to the low productivity of local varieties (chalimbana). ADMARC collapsed due to structural adjustment policies, but vendors emerged due to market liberalisation. Towards the end of the decade, a new and improved groundnut variety (CG7) was introduced. 2000s: Groundnut production improved. The Ministry of Agriculture promoted a pluralistic and demand-driven extension policy, which helped to establish a number of extension service providers – one of which is NASFAM. Farmers were now being organised in groups, which facilitated production and collected marketing. More improved varieties were introduced, and the introduction of FISP improved farmers’ access to seeds. 2010s: Groundnut production continued to improve. Reasons include: increased tobacco rejection at the auction floors from farmers that are not on contract with tobacco farmers; the availability of groundnut seeds on the market, from FISP and also through support from NGOs such as NASFAM; local-level processing; organisations such as NASFAM establishing processing facilities; One Village One Product (OVOP) helping to establish oil production. It can also be noted that in the 1990s groundnut production dropped further, due to the decline in productivity of the local variety (chalimbana) and also due to the collapse of Agricultural Development and Marketing Corporation (ADMARC). ADMARC was established as a statutory corporation under the Laws of Malawi. The Act and other laws allowed ADMARC to enjoy the monopoly status in the purchase from smallholder farmers of a range of controlled crops. ADMARC main responsibilities included: procuring and selling of farm inputs to smallholder farmers; buying produce from both traders and smallholder farmers at good prices, add value for sale on both export and domestic markets; ensure easy accessibility of staple food maize through a vast market network in the country; provision of reliable markets for smallholder farmers; and attend to social obligations on behalf of the government through handing of Farm Input Subsidy Programme. During this time, ADMARC, which was the main market for the groundnuts. However, towards the end of this decade, a new improved variety (CG7) was introduced. CG7 is high yielding, drought tolerant and easier to harvest than chalimbana. The 2000s saw an increase in the production and marketing of groundnuts resulting from a number of factors, the most significant of which was the introduction of NASFAM. The establishment of collective marketing among farmers, thanks to group organisation, also helped to improve their bargaining power, and a farm input subsidy programme, along with NASFAM, provided improved access to better quality groundnut seeds. This latter factor was further buttressed by a greater emphasis placed on the promotion of improved seed varieties (primarily CG7), which boosted production. 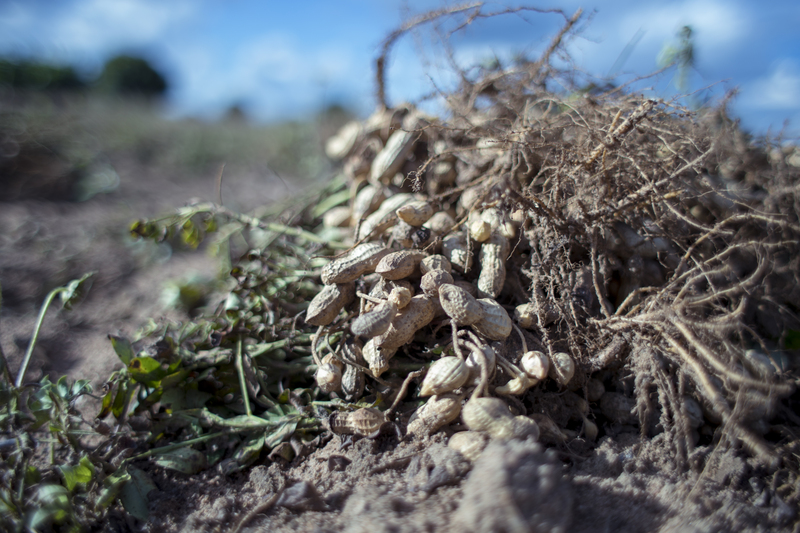 The findings also show that in the 2010s, groundnut production is continuing to improve, as producers move from tobacco production to alternative cash crops – one of which is groundnuts. “There are many…people who use the land they were growing tobacco [on in order to] grow groundnuts. Some have stopped producing tobacco altogether,” says one farmer from Ntchisi district. This can be attributed, in large part, to an increase in the quantity of tobacco rejected at auction floors, coupled with the fact that there are a greater number of organisations promoting groundnut production, such as NASFAM, One Village One Product (OVOP), Afrinut. Further contributing factors include better access to improved seeds, the availability of local processing facilities and a ready market for the groundnuts. Groundnut production in Mchinji and Ntchisi districts of Malawi, then, provides a good example of commercialisation in the country’s agricultural sector – and our recent study goes some way towards uncovering the contributing factors in this process. There are, of course, a number of challenges that continue to hinder the commercialisation of Malawi’s groundnut sector. Key examples include: poor seed storage, inadequate access to good quality groundnuts seed by farmers, poor access to lucrative markets, a lack of national technical response to aflatoxins, the dominance of the informal sector in groundnut marketing, and unregulated informal market. Written by Loveness Msofi Mgalamadzi, Masautso Chimombo, Blessings Chinsinga, Stevier Kaiyatsa, Mirriam Matita, Jacob Mazalale, and Ephraim Chirwa.